Ruby Red Shoes lives in a colourful caravan with her grandmother. Ruby is gentle and kind and cares for all living things, including plants and trees, animals and people. Ruby is also particularly fond of strawberry jam and peppermint tea. This book would be the perfect choice for little girls who think they are too old for picture books (although we know you are NEVER too old for picture books). It’s half way between the size of a novel and a picture book, but it feels more like a novel as it is longer than a picture book, with, 48 pages but it still has coloured pictures on every page. She talks to animals and plants when she spends time in the garden, she likes cosy tea times with friends, she likes to curl up in cosy chairs and read, and snuggle in feathery quilts. She grows veggies, teaches chickens to play soccer and one of her most cherished places is an old claw foot bath where she has imaginary adventures. 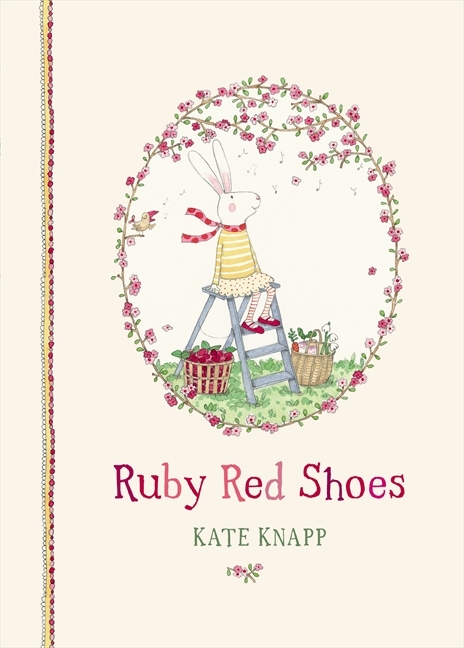 Ruby is an aware hare, and the book is filled with the descriptions of the world around her, twinkling stars, floating butterflies and a washing line that makes happy snapping noises. This book is a must for girly girls, but it may be a little too nice and sweet for many readers. Everything is just so nice, quaint, calm and sweet. These rabbits are living the life many of us would like, if only ‘real life’ didn’t get in the way. The only little bug bear I have about this book is the bath. I had to go back a re-read the book, because I thought the bath would have to be in a house somewhere, but no, it seems this little old gypsy caravan is like a tardis, because it manages to conceal a giant claw foot tub, the bed on the last page however, is perfectly caravan sized, complete with built in storage beneath.